Hi! I’m Shari and I’m still in an ecstatic state of shock of being here as your Guest Creative Guide today!! I was completely blown away when Brenda invited me to Guest for Annie’s challenge of Tic-Tac-Toe and I hope I do not only all of the Creative Guides proud, but all of the wonderful Tim Holtz goodies and techniques I’m using today proud, too!! 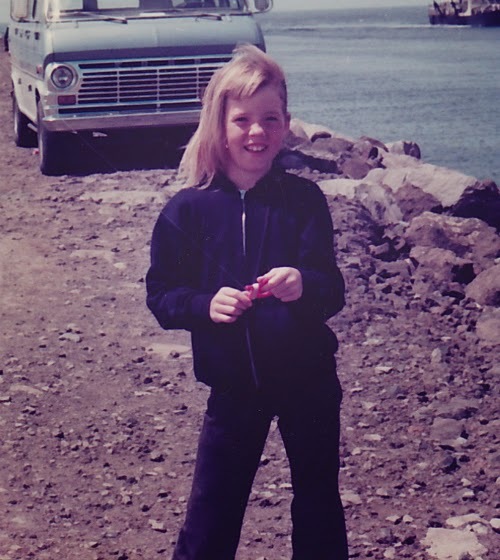 A little bit about myself—I’m originally from the Los Angeles area of Southern California, but now call the mountains of North Idaho my home with my hubbie Don and our furry family of 3 dogs and 2 cats and all the wonderful wildlife this beautiful area affords us. I’m a late bloomer to crafting and didn’t really do anything creative until I started making my own hand stamped cards when I was in my late 20’s, around 1997. I was a clean and simple card creator back then and ended up taking a break from it for about 5 years, between 2005-2010. 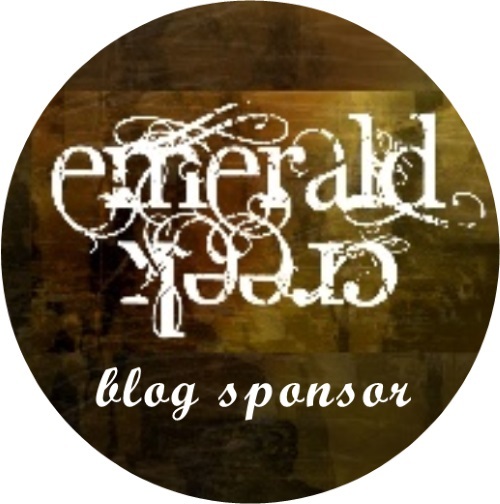 When I re-emerged, I realized much had changed while I was away and OMG!—who is this Tim Holtz guy?! Exciting times ahead, indeed! It only took one of Tim’s video’s to set me on a completely different course of creating and I haven’t looked back since!! 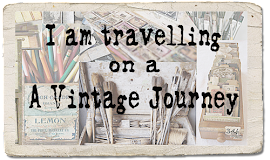 It’s a creative journey that I never thought I’d be on, and I’m so glad to share the things that I’ve learned (and am still learning about) with you here at A Vintage Journey today! Let’s Play! Annie’s game of Tic-Tac-Toe, a la Tim Holtz, pretty much means carte blanche on creativity and gosh--Which move to make, which move to make?! I’m taking left-vertical with Idea-ology/Paint/Foil Tape. Wait, I’m moving bottom-horizontal with Foil Tape/Texture Fades/Stains. No, I’ve got right-vertical covered with Ribbon-Twine/Die Cuts/Stains. I love all of Tim’s techniques but one of my favorites is creating backgrounds. I love layering his Distress Inks, Paints, Stains and now his Spray Stains together to form one-of-a-kind backgrounds to build upon. I’m using one of Tim’s Cabinet Card Frames to showcase one of his Found Relative cards. I altered the cab-card with Picked Raspberry & Barn Door Distress Paints that I finger painted over the surface and heat dried. 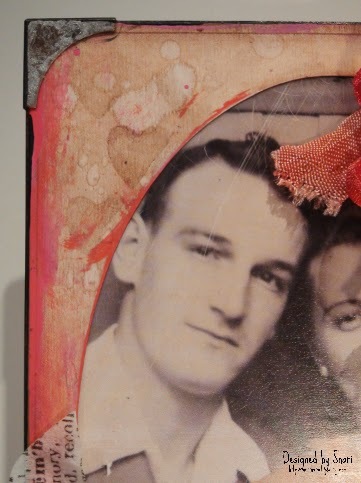 When dried, I rubbed Tea Dye & Vintage Photo Distress Inks over the painted surface. I used the Hearts Layering Stencil and Walnut Stain Distress Ink to add a few hearts, then I spritzed and flicked a bit of water over all of it for those wonderful water spots and heat set. I tinted the Found Relative card with my Worn Lipstick Distress Marker, giving the lovely lady a little color in her blouse. Then I roughed up the surface a bit with my sanding block by lightly pulling the block over the surface and edges, then inked over the surface with Tea Dye Distress Ink and my ink blending tool. I have a confession to make—The heart embossed piece of foil tape…I used my Hearts Layering Stencil to create the embossed hearts! I didn’t realize how little foil tape I have left in my stash and the pieces that I do have, were already embossed with polka dots. I didn’t want just polka dots, so I grabbed my Hearts LS, a couple of silicon mats and ran it all through my Big Shot. I cheated on using –Texture Fades- but it’s a good improvisation with using your Layered Stencils for embossing! I used my Tattered Florals die with a few different colored card stocks and gesso’d & Distressed stained tulle to create the blooms. I also used my Garden Greens die to cut out the leaves from Tim’s tissue wrap. Each bloom was given a gumdrop center that I have colored with Adirondack Alcohol Inks. 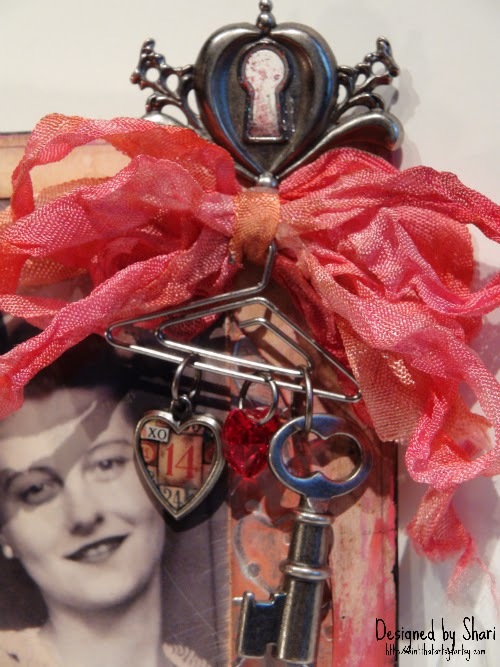 I topped the card with seam binding that I colored with Picked Raspberry, Worn Lipstick & Barn Door Distress Stains, tied into a fancy bow, embellished with a Locket Key, Heart Charm and a crystal heart all hanging from a Hangar Clip. See the glitter inside the keyhole? 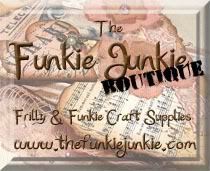 I got that idea from Anita-The Artful Maven, who has an astonishing Tim Holtz style all her own! I hope you enjoyed my play with Annie’s game of Tic-Tac-Toe today! Thank you to the Creative Guides for having me and before I close I’d like to leave you with one of my favorite Tim quotes—“Embrace Imperfection”!! Wow isn't this just a sensational altered cabinet card? What fabulous colours and techniques and oh I hope you didn't miss that little tip about using your layering stencils to emboss with. Thanks Shari for a beautiful Tic Tac Toe project and fabulous steps guiding us through your make. It is beautiful. Well I hope you've all had a lovely Valentine's Day weekend and have a great week ahead. See you Friday with another fabulous challenge. It will be the last one before our big birthday bash. A wonderful make from the lovely Shari! Romantic and beautiful, love this altered cabinet card! Great use of embellies too!! What a gorgeous make! The flower and ribbons are so opulent and fabulous, and I love the hanging charms. What a wonderful warm rosy hue too - fantastic! 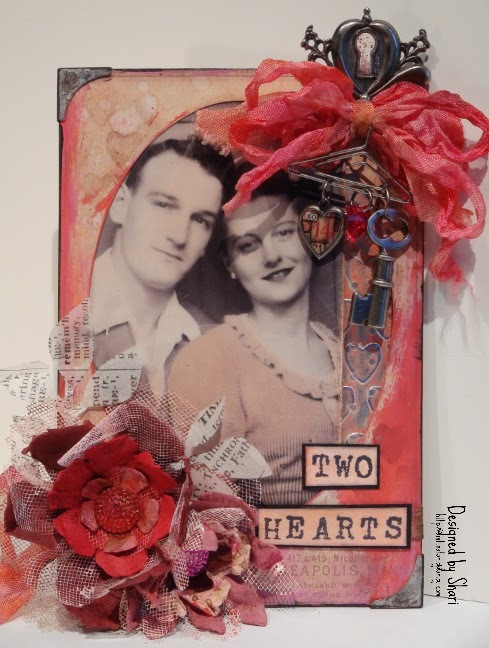 This is just wonderful Shari - so many great techniques and products used to make this a Tim worthy vintage Valentine - thank you so much for being an AVJ Guest Creative Guide today! A stunning project Shari, which I have enjoyed drooling over all your techniques and wonderful result. Lovely to have you guesting with us today. 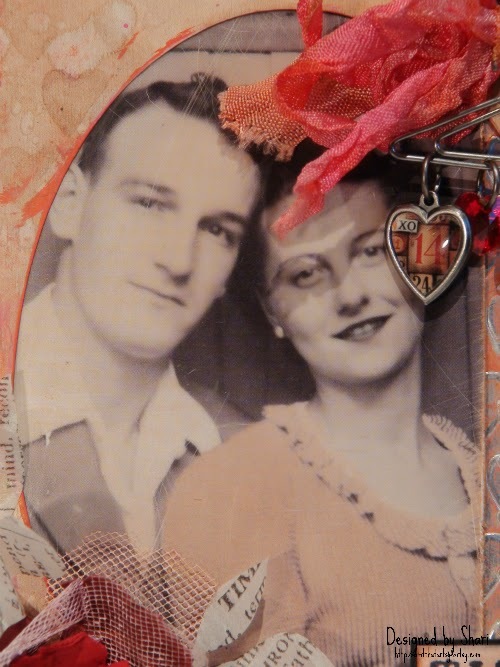 Beautiful altered cabinet card Shari and great tip on using your LS to emboss the foil! Thanks so much for sharing your wonderful project. This is stunning! 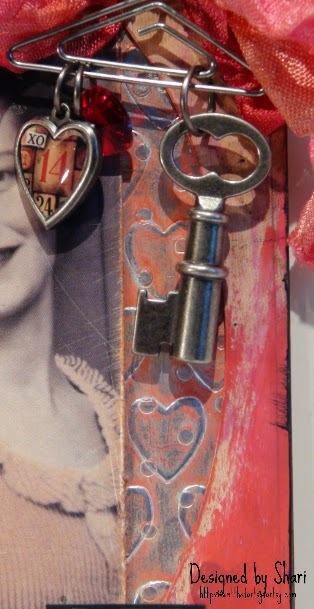 Love that key and heart on a hanger!! You did everyone proud indeed!! Love every detail shared here. Thank you so much for sharing your talents with us. Shari, what a wonderful artist A Vintage Journey chose to showcase Annie's Tic Tac Toe Challenge. You certainly filled your card up with all kinds of great techniques and how stunning it all is! Love the colors, the use of the layering stencil over the dots! And a gorgeous job you did with the Found Relatives! The charms are such a perfect finishing touch to this masterpiece! Thank you for sharing all your steps! This is such a romantic beauty Shari. Loved the techniques you shared especially embossing with the stencil! Now that opens a very big door for me, lol! Thanks for sharing. 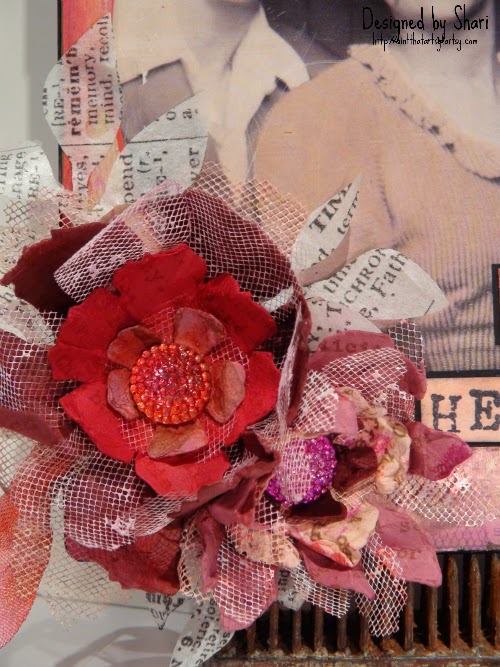 Fabulous project Shari, lovely warm colours and embellishments to drool over . I also enjoyed reading about your crafting journey which had me chuckling along with you. Such a lovely project to share with us Shari and so wonderful to have your talents here! The techniques and design are executed in utter perfection! Love it much! This is just fabulous, great colours and textures.